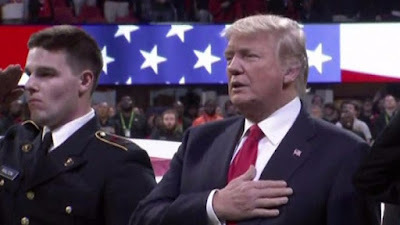 Did Donald Trump Forget Their National Anthem? Just days after describing himself as "like, really smart" and "a very stable genius," Donald Trump attended the CFP National Championship football game between the University of Georgia and the University of Alabama in Atlanta, GA, where he joined the Zac Brown Band and a gospel choir in singing the national anthem . . . or, at the very least, attempted to. As cameras panned to Trump on the field, some viewers were quick to call out that Trump had messed up the lyrics or had forgotten them altogether. "It looked like Donald Trump just kept repeating 'applesauce' during the National Anthem," one Twitter user wrote. Another person tweeted, "Trump was mouthing some words during parts of the national anthem, but it was unclear what he was saying. He didn't open mouth during other parts." It's also worth pointing out that Trump tweeted about the importance of the national anthem earlier, saying that he wants the American flag respected and "we want our NATIONAL ANTHEM respected also!" Hmm, Irony? Lol.